Scholars in our field, Operations and Supply Chain Management (OSCM), are under high pressure to show research productivity. At most schools, this productivity is measured by the number of journal articles published. One possible response to such pressure is to improve research efficiency: publishing more journal articles from each data collection effort. In other words, using one dataset for multiple publications. As long as each publication makes a sufficient contribution, and authors ensure transparency in methods and consistency across publications, generating more than one publication from one data collection effort is possible. The aim of this Notes and Debates article, however, is to draw attention to inappropriate reuse of empirical data in OSCM research, to explain its implications and to suggest ways in which to promote research quality and integrity. 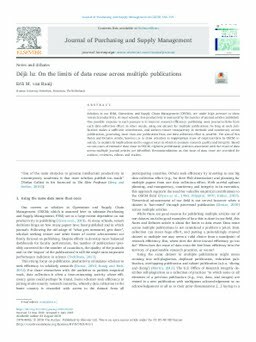 Based on two cases of extensive data reuse in OSCM, eighteen problematic practices associated with the reuse of data across multiple journal articles are identified. Recommendations on this issue of data reuse are provided for authors, reviewers, editors and readers.